The Greater Amman Municipality (GAM) and Optimiza signed a 3 year institutional agreement to provide modernity and advanced Microsoft technology to work environment and to help transform Amman into a smart city, the results of which will be directly seen by citizens. The agreement was signed by Amman Mayor Akel biltaji and CEO of Optimiza M. Majed Sifri at GAM’s premises, with the attendance of the GM of Microsoft Jordan Hussein Malhas and the City Manager eng. Fawzi Masaad. 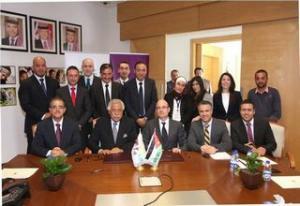 Biltaji said that this agreement represents GAM’s concern in using the latest technology systems and software to transform Amman into a smart city and within its policy to develop operating systems and obtain best techniques to enhance productivity and facilitate workflow. He added that GAM is seeking to enhance provided services pointing to announcing Amman as a member of the c 40 since it is considered one of the cities with impact in the region and its participation in the 100 resilient cities in addition to its readiness and willingness to improve performance in dealing with crises and disasters. The GM of Microsoft Jordan, Hussein Malhas, said that this agreement is considered one of the most important agreements for institutions to minimize costs and maximize the value of provided services and products in the computerized environment of today.